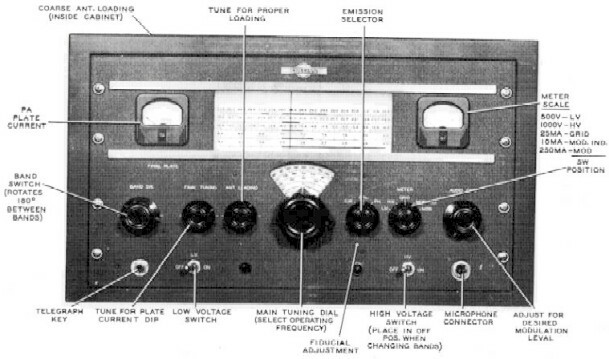 Complete coverage of the 80, 40, 20, 15, 11 and 10 meter bands is obtained with the 32V-1. Quick band-change on all stages is accomplished by bandswitching. Tuning controls of the permeability tuned circuits of the 1st, 2nd, and 3rd multipliers are ganged with the oscillator. The final tank consists of an impedance matching pi-network with two separate controls located on the front panel, one for tuning and one for loading. A course loading adjustment is located inside the top of the cabinet. A type 4D32 tetrode power amplifier tube is used in the PA stage. The plate circuit is tuned by a pi-network which is band-switched along with the multiplier stages. The output network can match a wide range of antenna impedances. 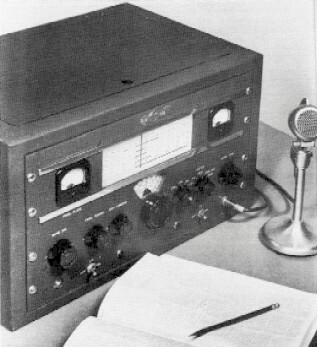 A CW sidetone oscillator is used to monitor CW transmissions. A receiver muting connection is available for silencing receivers such as the type 75A during CW transmission break-in operation. Two heavy duty toggle switches control the low voltage and high voltage circuits. The switches are so arranged that the high voltage cannot be applied until the low voltage circuits have been energized. The transmitter has push-to-talk (PTT) capabilities so that the microphone PTT switch may be used to apply the high voltage instead of the HV toggle switch. 115 volts ac 50/60 cps single phase. The nominal rated power input of the 32V-1 is 120 watts on phone and 150 watts CW. 12 7/16 in. high, 21 1/8 in. wide, 13 7/8 in. deep.